"It was raining in the city by the bay. A hard rain. Hard enough to wash the slime out of the streets and back into the holes they crawled out of . 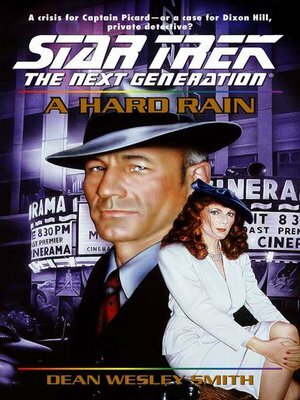 . ."
In the hardboiled style of a classic West Coast crime novel, HARD RAIN seamlessly blends the real world of the USS Enterprise with the fictional version of San Francisco 1941, as seen by Captain Jean-Luc Picard's own holodeck creation, detective Dixon Hill. The story begins with the Enterprise stuck in an anomaly, warping both space and time so that for every minute the ship is trapped, a month goes by in normal time. The only piece of equipment that can get the ship safely home has been stolen by gangsters in the Dixon Hill holodeck program. Captain Picard, as Dixon Hill, ventures into this San Francisco world to confront the ruthless crime boss and retrieve the crucial item. Soon after, the first of a series of murders on the Enterprise occurs and the murder weapon is found to be a revolver . . . from 1941 Earth. Who is behind the murders? All the clues are given. All the suspects are given. Readers will be engrossed in trying to figure out the answer . . . but only the very clever will guess the murderer's true identity before the final chapter.